It took place in Kyiv maternity hospital No 2. 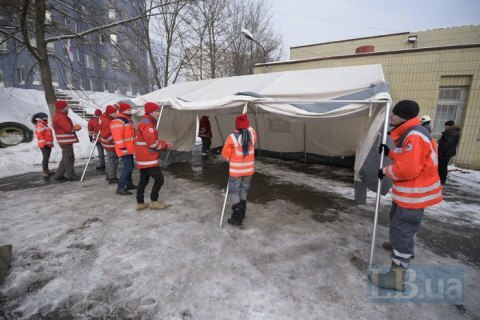 Kyiv's rescue services have held a command-and-staff exercise to coordinate their actions in the case of emergency caused by cyber attacks, power and Internet disruptions. During the contingency exercise held in maternity hospital No 2 in the city's Podilskyy district, they practised response to a power blackout. In particular, rescuers trained to connect the backup power supply, heat the premises with mobile fan heaters, evacuate the personnel and patients of the maternity hospital. As part of the exercise, they towed away a trolleybus which stopped in the middle of the road as a result of a power outage. They also provided help to people blocked in an elevator. In December 2016, hackers attacked Ukrenerho's power grid. Due to a malfunction in the automatic control system at the Northern substation, some of Kyiv's neighbourhoods on the right bank of the Dnipro River and adjacent areas lost power supply. In December 2015, a significant part of Ivano-Frankivsk Region and Ivano-Frankivsk was disconnected from the grid due to an interference into the energy company's computer network. Russia is believed to be behind both attacks.